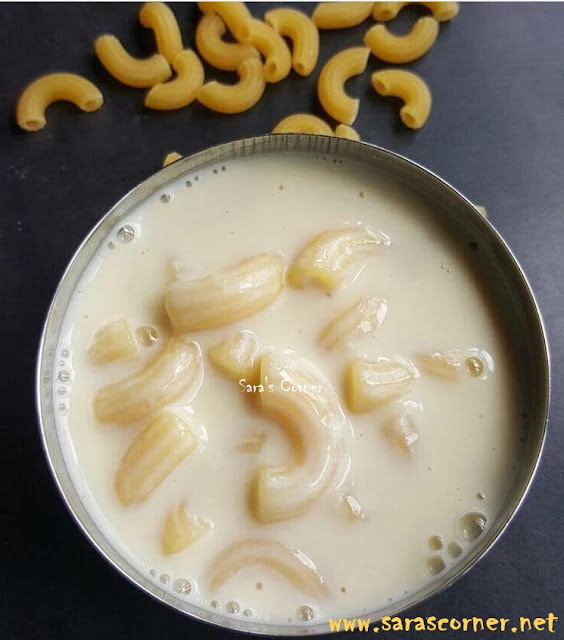 Macaroni Payasam | Pasta Kheer! Macaroni Payasam | Pasta Kheer is an easy dessert and loved by kids. After all the festivals I have started to post recipe, planning to blog regularly from now on. I prepared this for navaratri. It was different and tasted delicious. ~In a vessel/bowl boil water, add a pinch a salt and 1 tspn ghee enough to cook pasta. ~Once pasta is cooked wash in cold water. ~Boil milk in heavy bottom vessel/pan. Keep in low flame to thicken. ~Mix custard powder in a bowl make a paste with milk and add to the milk. ~Add sugar n keep stirring. ~Add cooked macaroni to the milk. ~Let it boil for 10 mins in low flame. ~Off the stove. Allow to cool. Macaroni Payasam/Kheer ready to serve. - Condensed milk can also be added. - It can be done without custard powder. - Can add cardamom/elaichi powder too.